A Mulatto Man in Custody. 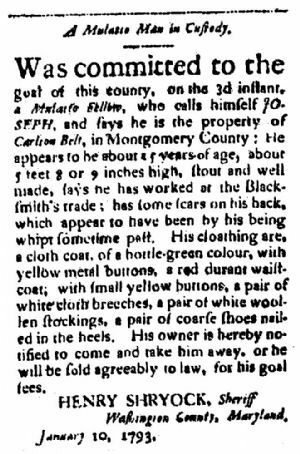 Was committed to the gaol of the county, on the 3d instant, a Mulatto Fellow, who calls himself Joseph, and says he is the property of Carlson Belt, in Montgomery County; he appears to be about 25 years of age, about 5 feet 8 or 9 inches high, stout and well made, says he has worked at the Blacksmith’s trade; has some scars on his back, which appears to have been by his being whipt sometime past. His cloathing are, a cloth coat, of a bottle-green colour, with yellow metal buttons, a red Durant waistcoat, with small yellow buttons, a pair of white cloth breeches, a pair of white woolen stockings, a pair of coarse shoes nailed in the heels. His owner is hereby notified to come and take him away, or he will be sold agreeably to law, for his gaol fees.